The bluegill and crappie bite had been quite impressive on this Northern Minnesota lake. Although the fish weren’t record breaking in size, they were very respectable. Even though they weren’t stacked in every single hole we drilled, there were enough fish in the area that we never had to look long to find action. This unexpected whitefish was the highlight of the day. As is often the case with the late season bite, our Vexilars were showing the active fish several feet off of the bottom in deep water. The bottom huggers were lethargic sniffers while the suspended fish could frequently be coaxed into biting. It was business as usual in the particular hole I was working when I noticed a line on my Vexilar above all of the others. Instantly, I made the adjustment to see if this new visitor to my screen was an interested biter. Once in front of the fish, it only took a couple of shakes from my Hexi Fly and maggots before my spring bobber dipped and I set the hook. I knew instantly this was not a bluegill or crappie. It had weight and power that I hadn’t experienced on this trip. It took quite a long time on my light tackle to tire this critter out. When I finally got its head started up the hole, I was not surprised to see a good sized whitefish on the end of my line. It seems that several times each winter I end up hooking something out of the ordinary. Over the years my crappie gear has yielded suckers, walleye, bass, northern, catfish, and yes, tullibee and whitefish. The trick to catching the unexpected fish starts way before they are seen on your electronics. The process actually starts with your equipment. Although I fish two-pound-test line for most of my winter panfish, I am very fussy about which line I use. There is not a lot of forgiveness in light line. One mistake and it is over. I have found Berkley Micro-Ice to be ideal for winter angling. 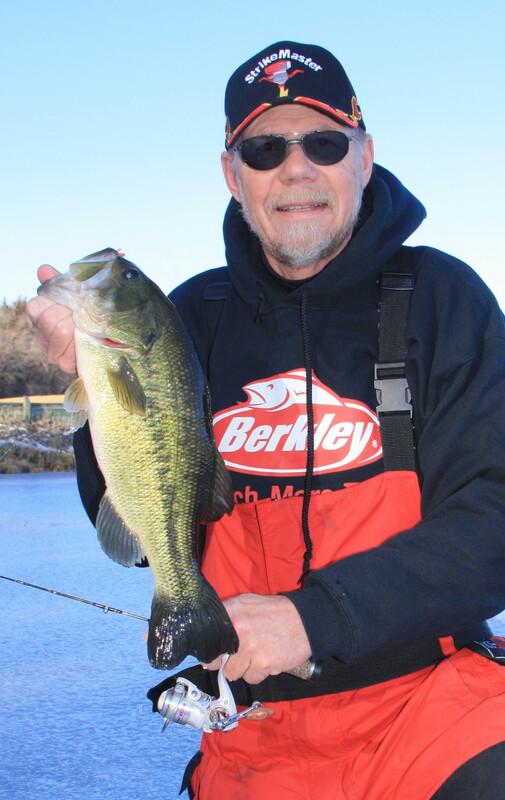 Even though this bass was a tussle, quality ultra light gear helped get it through the ice. Next, the rod and reel need to be matched to the weight of the line. Longer rods offer more forgiveness than shorter ones. The bend in the rod absorbs a lot of pressure and helps tire the fish out. The reel is also critical. It has to have a drag that works smoothly even in very cold conditions. If your drag hangs up on a good fish, you will be retying. I also believe in using a tightline system of presentation. This allows me to quickly change depths to get in front of the fish. These unexpected fish are usually just roaming through and if you can’t get their attention quickly, it won’t happen. 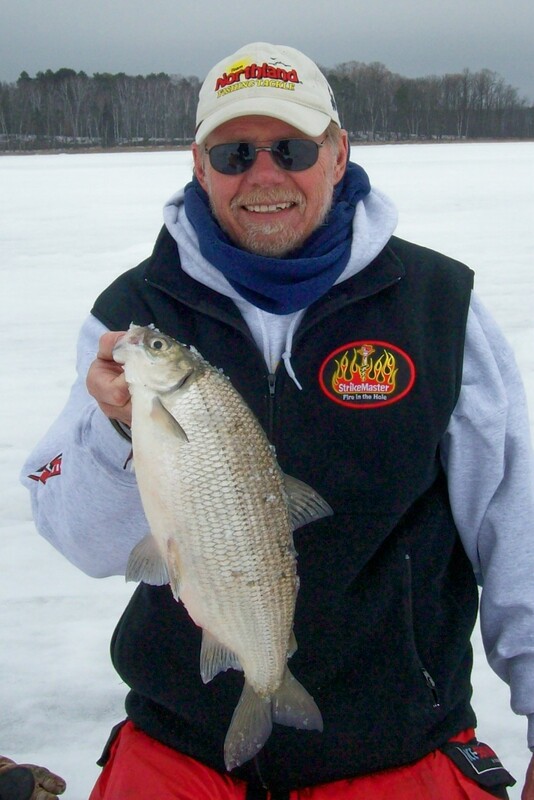 Catching unexpected fish through the ice is not an unusual phenomenon. I wouldn’t say I expect the unexpected, but it does happen often enough I am no longer surprised by the event. Large fish seem to have no trouble sucking in a tiny morsel if it is presented right in front of their face. The key in successfully landing the unexpected fish is being able to react instantly when it comes onto your screen and then have equipment that will handle the ensuing battle. When it all comes together, catching the unexpected can really make a day!